The second American map, which is of the East Coast of North America, is one of the most significant of the Vallard Atlas. It is again oriented to the South and has the latitude markers and distance scales in the left and right margins. In the Atlantic almost in the center of the map is one beautiful ship, partially surrounded by compass roses, exuding rhumb lines. 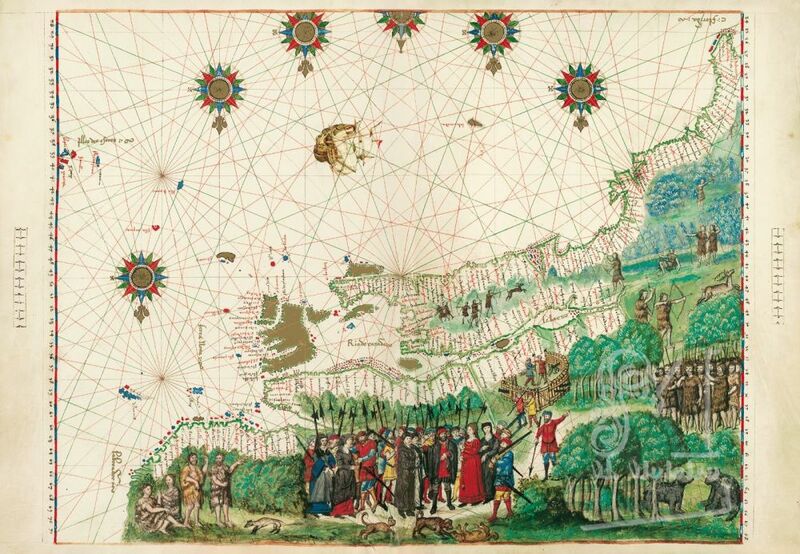 But what makes this map particularly important is its display of the geographical information brought back from the New World by the expeditions of Jacques Cartier in 1534, 1535-1536, and 1541-1542. Detailed are the Gulf of St Lawrence and the St Lawrence River and some of the wilderness beyond them, discovered and explored by Cartier in search of the elusive Northwest Passage to the Orient and who gave Canada its name. The meticulous representation of the coastlines with their numerous inlets underscores Canada’s potential for fishing and trade. He also reported fully on the Indians of the many tribes that he encountered. Shown in the forests of the mainland in an exquisite, almost late Medieval manner are Cartier, his well armed explorer-colonists, and the winter fort of Sainte-Croix. The Indians, who clearly are overshadowed by the Europeans, also are present observing them, hunting deer, and warring with each other. In addition to the deer, other fauna such as dogs, bears, and possums or foxes are present as well. This map is an aesthetic testimonial to the increasing French presence in the North Atlantic in the sixteenth century.